2018 has been a whirlwind year in the news. With Brexit, Trump, Russia, North Korea, the World Cup, and countless other events making headlines, it wouldn’t be surprising if you forgot half of the year’s most important events. Now it’s the festive season, we thought we’d take a look back at what was driving readers to share their opinions throughout the year. The year’s news started with a bang (so to speak), as news broke that adult film star Stormy Daniels had allegedly had an affair with US President Donald Trump and been paid $130,000 to stay silent about it ahead of the 2016 presidential election. Paid through a shell company set up by Trump’s personal attorney, Michael Cohen, suspicions started to arise that the payment itself might not be entirely legitimate, as seen in this NBC Think poll. The 2018 Winter Olympics were co-hosted by South and North Korea, despite half a century of clashes and tensions between the two. This year saw something of a re-brand on North Korea’s part, which began with the show it put on at the Olympics. Most NBC Think readers thought North Korea’s efforts amounted to little more than a propaganda stunt. Former Russian spy Sergei Skripal and his daughter Yulia were poisoned in Salisbury, England in March, throwing UK-Russia relations into crisis. UK Prime Minister Theresa May demanded an explanation from Russian premier Vladimir Putin as the nerve agent used was developed in the former Soviet Union and Skripal had also fed information to Britain, putting him at risk of assassination. HuffPost UK readers thought Russia posed a very serious threat, while Times Red Box readers thought Theresa May’s response would be met with laughter in Russia. April saw Facebook founder Mark Zuckerberg testify before Congress about the Cambridge Analytica scandal, in which data from 87 million Facebook user profiles were bought by elections consultancy Cambridge Analytica to produce individualised political advertisements. This is how HuffPost UK and Moneyish readers saw the ordeal. The 2018 FIFA World Cup was held in Russia this summer, beginning in June with the final between France and Croatia in July. Opinary users were very excited about all soccer-related polls, with questions about who would win each match garnering thousands and tens of thousands of votes. Of the 35 most popular polls in July, 31 were about the World Cup. Readers were flocking to share their views on the football competition, with engagement rates on World Cup polls up to 2x higher than average. Despite the optimistic atmosphere in England as fans put their faith in Gareth Southgate, Germans were much less confident about their chances of winning the trophy. This timeshift from Süddeutsche Zeitung shows how the nation slowly came to terms with their performance. There was a peak around May 25th when training started and as star goalkeeper Manuel Neuer became fit to play, but swiftly dropped as the team lost to Austria and gave a lackluster performance against Saudi Arabia. Readers became slightly more optimistic after the German team rallied against Sweden and fans anticipated an easy win over South Korea, though we now know things didn’t go so well. The world was captivated in July by the story of 12 Thai children and their soccer coach trapped in Tham Luang cave, miraculously surviving their ordeal before being rescued by divers. Elon Musk wanted to get involved, designing a mini submarine to help some of the children, who could not swim, escape from the cave – but the craft was deemed unfit for purpose by divers familiar with Tham Luang. HuffPost UK readers suspected that Musk’s involvement was more of a PR stunt than anything else. In August, InfoWars host and conspiracy theorist Alex Jones was banned from social media outlets and had content removed from YouTube and Spotify after his rhetoric was deemed islamophobic and racist. This sparked outrage about censorship of right-wing content, with many claiming large corporations were biased against their views. Washington Post contributor Jamal Khashoggi disappeared in October after he was last seen entering the Saudi consulate in Turkey. It was suspected the Saudi government was to blame for the disappearance, with many world leaders calling on Saudi Arabia’s Prince Mohammed Bin Salman for an explanation. Donald Trump remained reluctant to condemn or criticise the Saudi Crown Prince, citing the amount of money and jobs the US gains from business with the country. Barron’s readers believed the time had come for the States to cut business ties with the regime once and for all. The US mid-term elections were held on November 6, Donald Trump’s first real electoral test since being elected president. Given the media attention afforded to more progressive candidates such as Alexandria Ocasio-Cortez, there were optimistic forecasts for the Democrats’ chances, even though Republicans controlled the House, Senate and president. NBC Think voters suspected the Democrats would come out of the battle better off than the Republicans, but in the end the GOP made gains in the Senate while conceding the House to the Democrats. December has seen some chaotic upsets in the UK around Theresa May’s proposed Brexit deal. The government was found to be in contempt of Parliament. A TV debate between May and Labour Party leader Jeremy Corbyn was scheduled by two separate networks, squabbled over and then cancelled. And on the day of Parliament’s vote on the deal, May postponed it, anticipating defeat. She then faced off a no confidence vote sparked by rebellions from her own MPs. With the March 29, 2019 exit deadline looming large on the horizon and no agreeable deal in sight, Yahoo News poses the question: what if the whole thing were just called off? Brexit has been one of the biggest and most divisive topics of the year. Here’s what readers had to say on the topic of a second referendum. If you want a more in-depth look at users’ Brexit sentiments, check out this post from the Opinary blog. That’s all for this year – all the best for 2019 from everyone at Opinary. Facebook has had a tough time recently. After losing the trust of its users and breaching data protection regulations, Mark Zuckerberg has had some serious grovelling to do. Opinary is a revolutionary way for newsrooms to start conversations with their readers, and listening is just as important as asking the questions. That’s why we make it easy for you to analyse your users’ opinions at a glance, and offer several ways for you to take a deeper look at what they’re telling you. As soon as a user votes on an Opinary poll, they are given an instant breakdown of the results. On the speedometer, each dot represents a percentage point, so it’s easy to see the distribution of votes at different points in the scale. This is a great way to find out how strongly your readers feel about specific issues, and which opinion leaders they identify with the most. 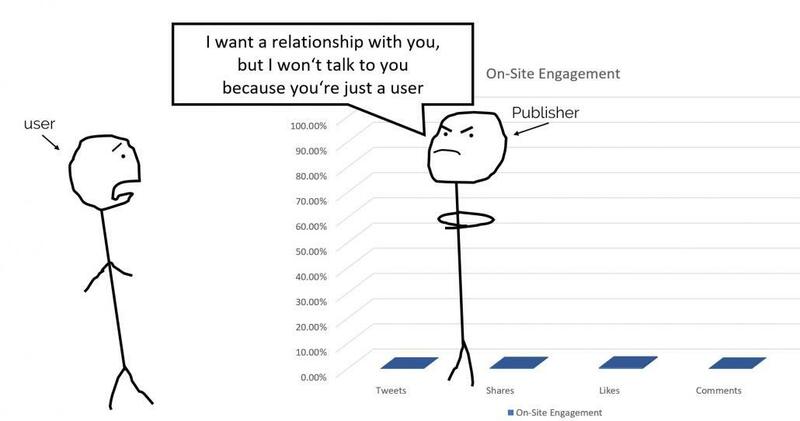 So you know what your readers are thinking, but was your question engaging enough? Did they care enough about the topic to vote? Every Opinary publisher has access to an Analytics Dashboard which allows them to assess the performance of individual polls. This will allow you to keep track of all the polls you used, and make changes to any you think could be improved. 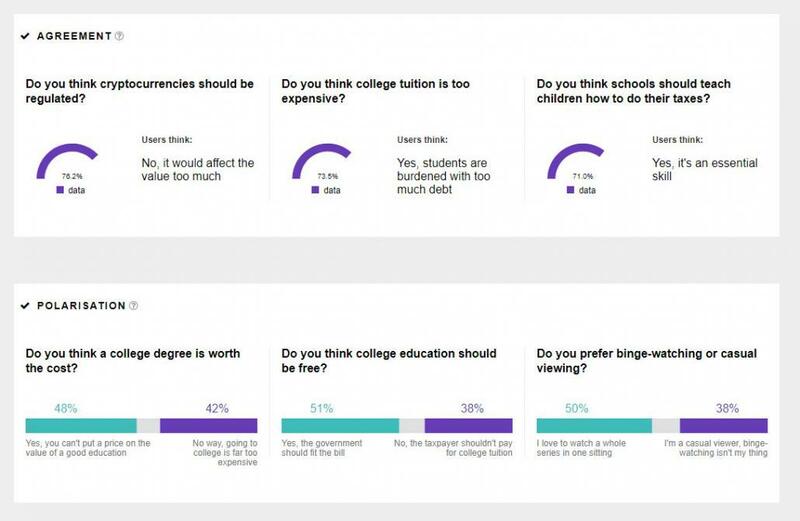 Another resource we provide is our Insights Dashboard – it offers an overview of audience sentiment. You can use this to see what your audience agrees on, what they disagree on, and how their opinions have changed over time. We also have an in-house data science team who can provide even deeper insights, for a range of purposes including special editorial projects, audience analysis, and content generation. Your readers will love to see that you’re listening, so why not write an article about the interesting insights you’ve gained from your Opinary polls? Reach out to your Opinary representative or use our contact form to see how we can help you. As publishers around the world strive build better relationships with their audiences, it’s understandable that many treat their readers like customers. But what if you stopped treating it like a business transaction and started treating it like a relationship? How do you show your value on the first date to secure that all-important second date, and hopefully begin a lasting relationship with this person? Sure, having a fling and getting what you need from a one-time user is great, but what if you’re losing interest in those one-night-stands and want something more meaningful? Is that one quick click enough to satisfy you, or do you want your reader to click with you every night as part of a long-term relationship? You could get that one click/ad impression from a user and never see them again, but that means you’re constantly searching for the next one. 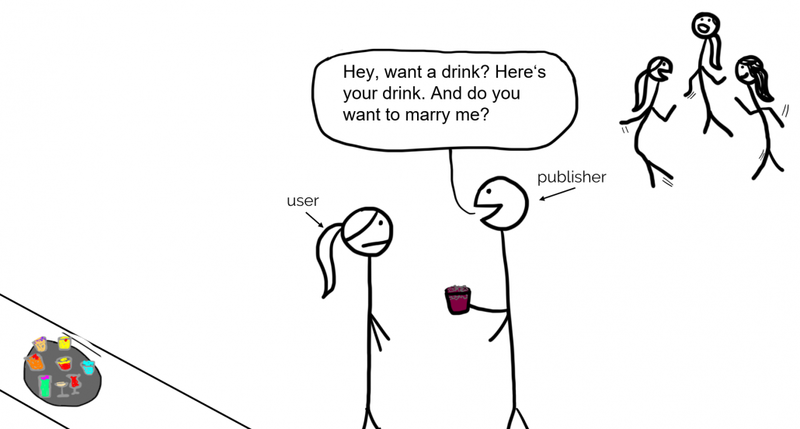 Constantly putting yourself out there to find another reader who wants to click with you. By building a more meaningful relationship, you could have a committed user who will care about your content for weeks, months, or years to come. It just takes a little patience and persistence. Would you propose to someone on the first date, or ask your Tinder match to be your boyfriend before you even met? No. And would they say yes if you did? Probably not. 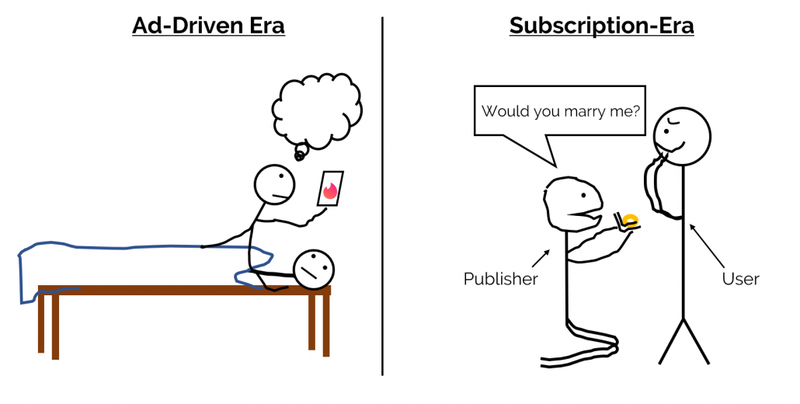 So why should a first-time reader buy a paid subscription if you haven’t shown your value yet? It’s better to ease into things, take it slow, and get to know each other first. You can’t just jump straight into things and expect your desired result. Building a relationship takes a lot of communication over time. You text, you talk, you discuss issues, you have deep meaningful conversations. So why are some publishers so reluctant to start a conversation with their readers, who are human beings, and preferring to think of them as statistics and numbers in a spreadsheet? Many news sites offer few chances for readers to actually interact, instead opting to overload users with adverts (or pop-ups asking them not to block their ads). It’s no surprise that comment and interaction rates on many news sites continue to linger around 5%. Opinary has found a unique and effective way to foster this communication and enable publishers to build the loyalty they crave. Think of us as your relationship coach. We understand the engagement funnel and have built tools to effectively demonstrate your value to your readers. We make it easy to engage, understand and convert users by starting with a simple conversation. With industry leading engagement rates of 15% (versus 0.2% in the average comment section), we’ve learned that users feel rewarded and heard when they have the opportunity to share their opinions. Using our knowledge, we can effectively convert those engaged users into social followers, paid subscribers, app users, etc. Not only does this give you a more fulfilling and loyal relationship with your readers, that stable and consistent audience will also make you more attractive to advertisers and help you diversify your monetization strategy in a healthy way. Want more relationship advice? Send us an email or use our contact form. A recent Hubspot survey found that only 36% of executives were up to date with the General Data Protection Regulation (GDPR) and 12% admitted it was the first time they had even heard of it.